My most disappointing Cross Country race ever was the 1977. All Ireland Intermediate Inter-County Championship race. Despite the toughness of Cross Country running I knew that I was blessed with great stamina and staying power and that because I was a track runner at eight hundred metres I had a lot of speed for Cross Country so I figured if I could stay the pace with the group at all, I should have a great run in. That day in Maynooth my objective was twofold: to help Tipperary win the team gold and to make the Irish team by finishing in the top eight. With the race nearing its conclusion I was sitting pretty in third place, fifty yards ahead of the nearest chasing bunch. I knew that all I had to do was maintain my momentum and continue at a steady pace. As I swept downwards towards the end of one field the course swung left through a gap into the next field. In my mind I calculated that I had only two hundred metres to go, so I really upped the tempo. However, as I passed through the gap, I was horrified to discover that there was still one more full field to go before the final run in. It proved to be a costly error of judgement on my part. I could hear my coach roaring at me to slow down but it was too late to retrieve the situation. It wasn’t that anybody else got faster; it was just that my legs became leaden like over the final one hundred metres, and one by one was I overtaken and eventually relegated into ninth place. I was inconsolable afterwards, and the inevitable analysis during the course of a miserable journey home, only served to make matters worse. 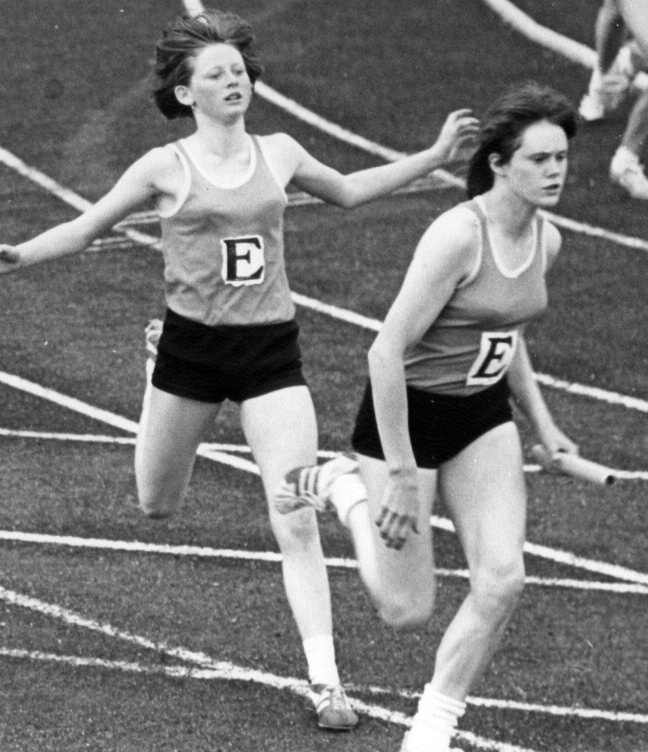 Handing the baton to Nora O’Grady for the final leg of the 1976 Schools All Ireland Winning Relay. Photos Courtesy of Margaret Moroney. It was a hard lesson to learn but I picked myself up and resolved to make amends in Midleton. Training was intense, and when Tony Hassett decided one night to introduce a series of three hundred metre runs uphill and flat out, our hearts sank at the prospect of it all. In truth, we were gobsmacked because generally you’d never be asked to run flat out in cross country training. As long as I live, I’ll never forget those successive hill runs. Tony measured three hundred metres metres exactly to the big oak tree in the middle of Burnell’s field. Having completed the run we were subsequently required to jog back down to the starting line, take a two and a half minute rest and then go again. We worked on those hill runs for about ten days, followed by two days of complete rest. In the days that followed, we engaged in a number of short sprint sessions on the track, supplemented by daily six mile runs at a steady pace. The training was a classic combination of aerobic and anaerobic. Aerobic mainly constitutes distance work for continuous steady running, the aim being to develop the hearts ability to withstand and endure. The Cross Country Championship race itself however is only one and a half to two miles long, hence the need for a series of fast runs. The latter was anaerobic training, designed to develop an ability to change speed when required. My date with destiny in Midleton was fast approaching but I knew I was running well. I could feel that edge inside me and knew my form was such that I was ready to peak just at the right time. Tony Hassett didn’t travel with us, but he told me in no uncertain terms that I simply had to make the scoring four, so my personal goal thereafter was to score for Team Ireland. As far as the individual event was concerned I didn’t give myself any chance of beating Mary Dempsey or Margaret Cadogan or of getting among the medals in the midst of such a high quality international field. The course itself consisted of three one thousand metre laps of a circuit, which started off as a steady run, continued up and around a good sized hill and culminated in a downwards run by the halfway stage of the first lap. I had found my feet and felt settled enough in among a leading group of eight. When we hit the downward run towards the end of lap two, Mary and Margaret upped the ante and put a big push on. I just followed suit along with two English girls. The funny thing was, I didn’t feel any stress whatsoever in my reaction to the sudden injection of pace instigated by my team-mates. This leading group of five soon left the rest of the field in its wake, and with one lap to go it suddenly registered with me that I was seriously in the shake-up to get among the medals. I knew my team-mates would try to find an extra gear once they reached the hill and that I had to be ready to react accordingly. When the critical moment arrived, I went for broke, and to my amazement, they never came with me, they never reacted or responded and I just kept going, kept the intensity up and drove on relentlessly towards the finishing line. The crowd was shouting all kinds of encouragement to me and upon crossing the line, I completely collapsed. I had no feeling in my arms and legs, the blood was pounding in my head and it took me about five minutes to stand up. I was too shattered physically to show any elation, but when I eventually pulled myself together I was overcome with pride and joy at the scale and significance of the achievement. Remembered by Margaret Moroney and written by Paul Gannon.